Message in a bottle wedding favors are a great DIY project bridal couples can do together. DIY messages offer the opportunity to personalize what you want to say to your wedding guests. Bottles: Size, shape, and color can vary, and bottles are available in glass or plastic. Consider whether you want bottles with a cork or a screw top, or if you prefer the bottles open. Favor-size bottles can be purchased at craft stores or bulk retailers, or you may be able to collect unique small bottles from thrift stores. Paper: The focal point of the favor will be the message, which can be printed or handwritten on a small piece of paper or parchment. Consider higher quality paper or paper with a homemade texture, or opt for paper color that matches the wedding colors. The paper may also be cut into a unique shape or have textured edges; slightly burned or torn pages are popular for a rustic effect. Ribbon: Ribbon may be used as a pull cord to remove the message from the bottle or it may be used to decorate the bottle. Different colors and widths of ribbons are available, or couples might choose specialized ribbons embroidered with the wedding date or couple's names. Leather cord and raffia are other options. Fillers: Small items added to the bottle give it character and uniqueness. Popular fillers include sand, beads, miniature flowers, small shells, a paper umbrella, confetti, glitter, gravel, or even a drop or two of fragrance. To make your own DIY message in a bottle wedding favors, have enough of these fillers to just cover the bottom of each bottle. Accents: Adding a decorative accent tied to the neck of the bottle is another way to personalize the favor. Options include larger shells, small starfish, themed charms that match the wedding such as an anchor, fish, palm tree, or shell, or romantic charms such as a heart, wedding cake or bridal couple. Heart stickers and custom labels are other options. Materials to make message in a bottle wedding favors can be purchased in bulk from many craft stores, party stores, or bridal outlets. Online retailers often feature materials for these types of crafts as well, but comparison shopping is essential to find the best materials at the right price. Papers, ribbons, fillers, and accents are easy to find. For the most unique favors, shop around unusual retailers and look for materials that suit your personality without being predictable. 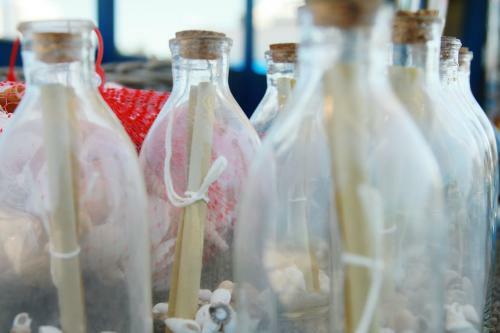 The steps to make message in a bottle wedding favors are simple and straightforward. Compose Messages: Print or write the message for each bottle. Thank you notes from the bride and groom, short wedding poems, and heartfelt sentiments are popular choices, and the note should include the wedding date and couple's names. This is the time to trim, burn, or carefully tear the edges of each note if that is not already done. Roll Messages: Papers should be rolled tightly enough to fit easily inside the bottle. A small sticker can secure each roll, or they can be fastened with a thin length of ribbon, cord, or string that will be used to help extract the message from the bottle. Use wax seals for a more rustic option. Add Fillers: Add the appropriate fill items to each bottle. If fragrance will be used, add 1-3 drops to each bottle and let it dry before adding other items. If large fillers are used (paper umbrellas or mini flowers, for example), insert just one or two into the bottle, or for smaller fillers (beads, sand, gravel, etc. ), fill no more than one-quarter to one-half inch of the bottle, depending on its size. While each bottle should be filled similarly, they do not have to be precisely equal. Insert Notes: Insert each note into a separate bottle, leaving the pull cord dangling outside the bottle so the note can be removed. For a simple bottle, use larger notes that will not fit fully into the bottle and no pull cord will be needed (Note: for larger notes, it is unwise to use small fillers that may leak because the bottle is not sealed). If necessary, cork or seal each bottle. Personalize Bottles: Add stickers, labels, ribbons, charms, or other accents to the outside of each bottle for a personalized finishing touch, but take care not to disturb the seal or protruding notes in order to keep the favor pristine until the wedding. Assemble bottles one step at a time to make the process faster. The full assembly does not need to be completed at once. To save time, assemble the favors several weeks or months in advance. Store bottles carefully to avoid damage or dust until the wedding. Display the favors at each place setting or placing them in a large, shallow bucket or tray of sand and shells to add to the beach effect. 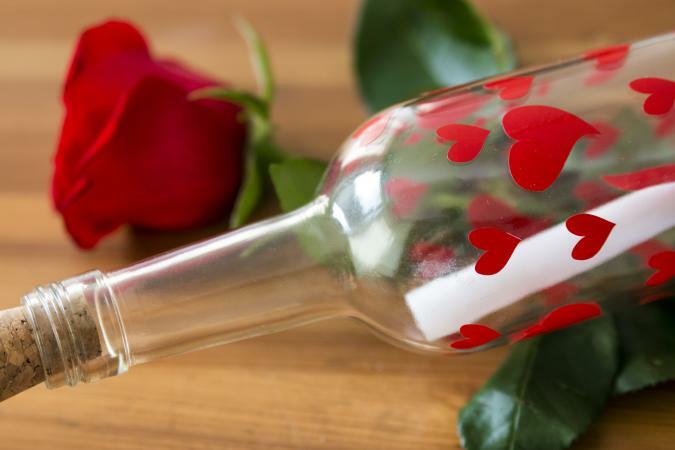 Avoid too many labels, accents, fillers, and decorations that can turn a lovely message in a bottle into a tacky trinket. Even brides-to-be who aren't expert crafters can easily assemble DIY message in a bottle wedding favors for unique and personalized gifts for their wedding guests, making the wedding day memorable and charming for all who attend.